Every believer should be on a journey through their Bible, cover-to-cover. Some people like plans and dates and calendars. I prefer to jump around a bit. Historical books one week, Gospels the next, but never repeating a book until I've read them all. This means there comes a point in my "reading plan" (there's no plan!) where I'm left mucking my way through the prophets. Mucking probably isn't a very nice term to use when talking about the holy prophets of God, but I'm being real with you. I dislike reading the prophets. They don't seem relevant to me. I'm not a doom and gloom kind of person. Apart from the books of Daniel and Jonah, I couldn't follow the story line if you paid me. I just get bogged down and out of sorts. I find myself praying that God will just get me through to the Gospels. However, lately I find myself in a parched place. Dry and thirsty. I recently finished the book of Acts and found myself unmoved and unchanged. Not good. I brought my heart of weariness to the Lord, and wouldn't you know He led me to Isaiah. Why when I was tired and frustrated would the Lord want me in the most confusing and time consuming part of scripture? I remembered a Bible study book I had on the shelf. I bought it several months ago intending to get over my dread of the prophets. It was a book about feeling secure in the arms of God. It was a book about Isaiah. The first devotional section covered Isaiah 1-12. Twelve chapters! I buckled down and read them. All of them. I read them slowly. Intentionally. Longingly. I gave them my time and attention, and the Lord did not disappoint. I have so much I want to share with you. Truth about standing firm in our faith, calling evil out for what it is, and remembering to let the Lord cleanse us and use us for his glory. I want to remind you what a blessing the Holy Spirit is in our lives and how we should daily be like Jesus judging with righteousness and equity. But today I'm just going to share with you a small piece of Isaiah 12. If you've ever found yourself lost and alone in the prophets, then flip to Isaiah 12 and be encouraged. It's a short chapter filled with strength and hope. They are verses that will one day be sung in the kingdom of God, when Jesus sits on his throne ruling the world with equity and truth, but really, why should we wait? That same Jesus rules and reigns in our lives! 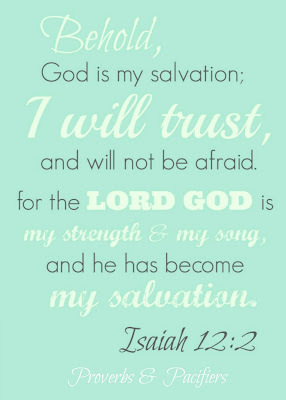 I pray this verse is the song of my heart today and for eternity! This is a first for me, but after reading and LOVING this verse, I had to do something with it! You can download free printable versions of this verse below (sans watermark). Once you download the file, you can upload the it to Walmart.com and have the image professionally printed for less than as a $1. You can even have it shipped to your house for free. 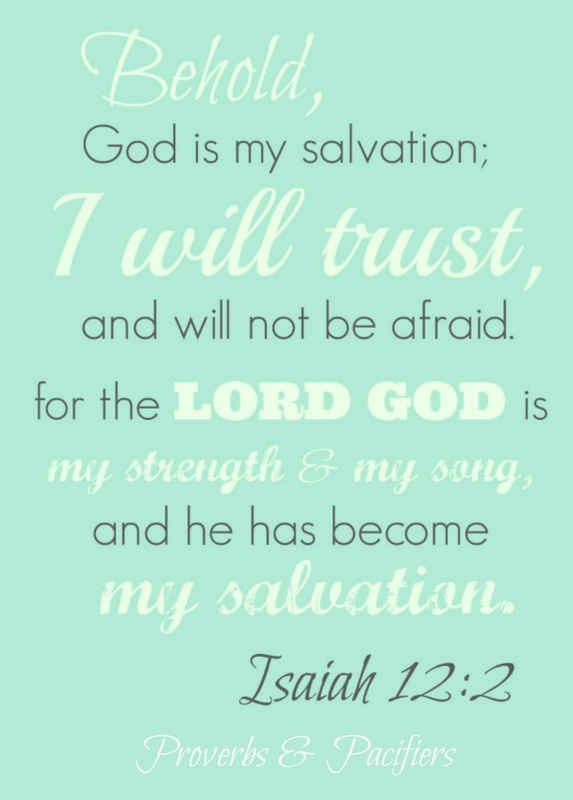 Hang it in your hallway, put it on your desk at work, or just stick it in your Bible as a reminder of our strength, our song, and our salvation. Enjoy! What devotional were you using? Sounds like a purchase worth making! Have you ever read a chronological bible? That really helps because it gives you the historical context if the prophets, side by side (mostly from 1 and 2 Kings and Chronicles). Very helpful! Gina, it's part of the Warren Wiersbe BE series. I think it's "Be Secure". This is the second one like it I've done and I really enjoy them!